Weingut Am Stein is nestled on the side of the most famous Franconian vineyard, the Würzburger Stein. Ludwig Knoll, together with his wife Sandra, meets the demands required for the production of superior quality modern German wines; incredible aromatics, purity of flavour, freshness and balance characterize their wines. Am Stein is a biodynamic wine producer. 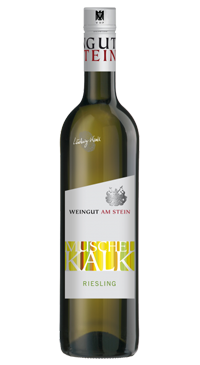 Muschelkalk, meaning Limestone, shows a great variety of flavors and is a clear example of the region. This wine is fruity, plump, juicy, powerful and expressive. It is an off dry style; with 10,5% ABV, 18,5 g/l of residual sugar and 8 g/l acidity to keep it lively. Stone-fruit, citrus and floral hints aromasn merge with enormous freshness on the palate. Mineral complexity derives from the terroir.